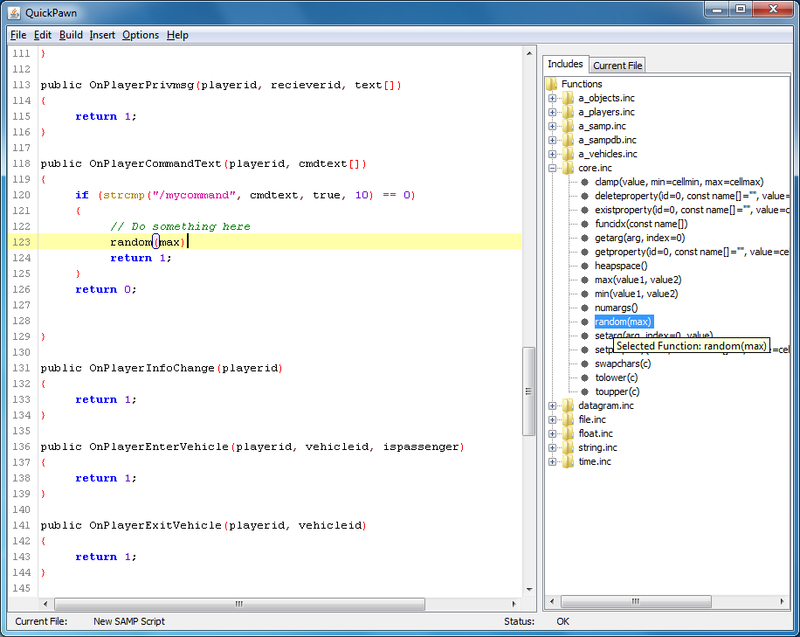 QuickPawn is a multi-platform PAWN code editor and compiler. 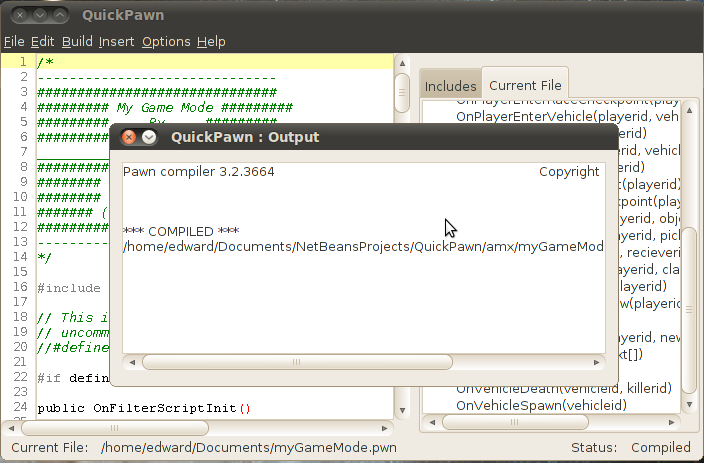 The main use and purpose of QuickPawn is to edit, create and compile PAWN scripts that run on SA-MP servers. I have an issue with this program. I am using Ubuntu 11.10 64-bit. I ran the compiler installer script, but when I choose “Linux compile” in QuickPawn, it just shows me an empty output window. Is it about the installation of pawn compiler or? Hey, did you definitely follow the instructions exactly in the readme, including where to run the program from on Linux and installing the compiler? It’s been a while and I’m already using Ubuntu 12.10 installed on a different computer. However, the issue has remained exactly the same. 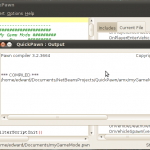 I executed the compiler installation script which did create Pawn folder in /opt. Also the QuickPawn starts up normally, but linux compile shows again an empty window. I tried with both OpenJDK6 and OpenJDK7. Then restart QuickPawn, try again and hopefully that should make the program executable and make it work properly. Very nice! I just have a suggestion, the editor doesn’t support some letters (á, ẽ, â, ó, etc…) and my language uses much of it. I’d be very glad if it is possible to add this feature. I’m thinking of doing a total recode of the program so I’ll remember that those characters don’t work. It’s probably because I didn’t save the files in a unicode format. Again, I appreciate the suggestion. Extract the .zip and run the .jar file. Make sure you have Java installed. I recently finally got it working to compile .pwn files on OS X using wine. Could you tell me if there’s a possibility to change the compile command which is being called? Is there any possibility to do so? I’m not used to Java. I don’t think there’s a way to edit the actual command being ran to the compiler from QuickPawn however you could try running the compiler from command line with the arguments you want to pass to it? Oh what the hell I’m stupid. It works anyways. Nevermind what I posted earlier. Thanks for the editor btw! 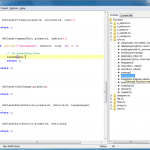 Hi, can you check if the pawn compiler file is present in the folder? Do you have any idea how to compile in Mac OS? Try following the instructions for compiling on Linux. What do you mean by “translated file”? Why when compiling the output trim in white and does not generate the file. amx? I am using xp wiandows and finish this test will use it in linux. It could be that it’s creating the .amx file in a different directory? Are there any errors on the output? Try searching for the .amx file it should have created. Someone was able to fix this in the past by moving the “libpawnc.so” file from “/opt/Pawn/source/compiler” to “/home/user/QuickPawn”. Maybe this will solve the problem for you?